Ash, J.L., Egger, M., Treude, T., Kohl, I., Cragg, B., Parkes, R.J., Slomp, C.P., Sherwood Lollar, B., Young, E.D. (2019) Exchange catalysis during anaerobic methanotrophy revealed by 12CH2D2 and 13CH3D in methane. Geochem. Persp. Let. 10, 26–30. Figure 1 Geochemical profiles (±2 σ) from Bornholm Basin from 3-35 MCD. Horizontal grey bar denotes sediments deposited during lacustrine conditions overlain with sediments deposited during brackish marine conditions. Samples were not recovered above the shallow SMTZ. Pink dashed lines denote a shallow (3.3 MCD) and deep (19.8 MCD) SMTZ; only the shallow SMTZ is shown in the bottom panel for clarity. Dark grey vertical bars in e and f denote equilibrium isotopologue compositions for the subsurface temperature of 7.8 ± 0.6 °C. Modelled CH4 production, Fe-AOM and SO4-AOM rates are shown in panel d (Dijkstra et al., 2018). CH4 production (purple) and SO4-AOM (gold) rates correspond with the upper x axis and Fe-AOM rates (brown) correspond with the lower x axis. SO4-AOM rates above the upper SMTZ are calculated using bottom water SO4 concentrations of 15.0 mM. Additional porewater data shown in Supplementary Information. Figure 2 ξ12CH2D2 values (±2 σ) are the most negative at shallow MCD, indicating the greatest departure from equilibrium and approach zero (violet dashed line) with increasing MCD, indicating an approach towards intra-species thermodynamic equilibrium. ΔG values for SO4-AOM and Fe-AOM suggest either metabolism is capable of reversibility (see Supplementary Information). Figure 3 Δ12CH2D2 is plotted versus Δ13CH3D. The solid black line represents theoretical thermodynamic equilibrium abundances (with dots representing 100 °C increments from 0-1000 °C). 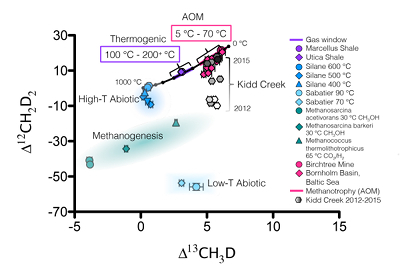 Methane produced by thermogenesis, high temperature abiotic reactions, microbial methanogenesis and low temperature abiotic reactions inhabit unique zones in double isotopologue space. AOM, equilibrating through exchange catalysis during enzymatic back reaction, also inhibits a unique zone: low temperature intra-species thermodynamic equilibrium. Bornholm Basin data (magenta diamonds) span between the methanogenesis and AOM zones, while data from Kidd Creek Mine (black to white symbols) (Young et al., 2017) span from the abiotic to AOM zone. See Supplementary Information for additional sample description. Edwards, K.J., Becker, K., Colwell, F. (2012) The deep, dark energy biosphere: intraterrestrial life on earth. 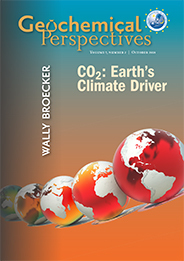 Annual Review of Earth and Planetary Sciences 40, 551-568. Marlow, J.J., Steele, J.A., Ziebis, W., Sheller, S., Case, D., Reynard, L.M., Orphan, V.J. (2017) Monodeuterated Methane, an Isotopic Tool To Assess Biological Metabolism Rates. mSphere 2, e00309-17. Regnier, P., Dale, A.W., Arndt, S., LaRowe, D., Mogollón, J., Van Cappellen, P. (2011) Quantitative analysis of anaerobic oxidation of methane (AOM) in marine sediments: a modeling perspective. Earth-Science Reviews 106, 105-130. Beulig, F., Røy, H., Glombitza, C., Jørgensen, B. (2018) Control on rate and pathway of anaerobic organic carbon degradation in the seabed. Proceedings of the National Academy of Sciences 115, 367-372. Conrad, R. (2005) Quantification of methanogenic pathways using stable carbon isotopic signatures: a review and a proposal. Organic Geochemistry 36, 739-752. Whiticar, M.J. (1999) Carbon and hydrogen isotope systematics of bacterial formation and oxidation of methane. Chemical Geology 161, 291-314. Holler, T., Wegener, G., Knittel, K., Boetius, A., Brunner, B., Kuypers, M.M., Widdel, F. (2009) Substantial 13C/12C and D/H fractionation during anaerobic oxidation of methane by marine consortia enriched in vitro. Environmental Microbiology Reports 1, 370-376. Holler, T., Wegener, G., Niemann, H., Deusner, C., Ferdelman, T.G., Boetius, A., Brunner, B., Widdel, F. (2011) Carbon and sulfur back flux during anaerobic microbial oxidation of methane and coupled sulfate reduction. Proceedings of the National Academy of Sciences 108, E1484-E1490. Yoshinaga, M.Y., Holler, T., Goldhammer, T., Wegener, G., Pohlman, J.W., Brunner, B., Kuypers, M.M.M., Hinrichs, K.U., Elvert, M. (2014) Carbon isotope equilibration during sulphate-limited anaerobic oxidation of methane. Nature Geoscience 7, 190-194. Egger, M., Riedinger, N., Mogollón, J.M., Jørgensen, B.B. (2018) Global diffusive fluxes of methane in marine sediments. Nature Geoscience 11, 421. Boetius, A., Ravenschlag, K., Schubert, C.J., Rickert, D., Widdel, F., Gieseke, A., Amann, R., Jørgensen, B.B., Witte, U., Pfannkuche, O. (2000) A marine microbial consortium apparently mediating anaerobic oxidation of methane. Nature 407, 623-626. Milucka, J., Ferdelman, T.G., Polerecky, L., Franzke, D., Wegener, G., Schmid, M., Lieberwirth, I., Wagner, M., Widdel, F., Kuypers, M.M. 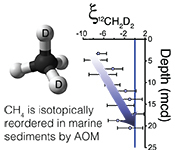 (2012) Zero-valent sulphur is a key intermediate in marine methane oxidation. Nature 491, 541-546. Scheller, S., Yu, H., Chadwick, G.L., McGlynn, S.E., Orphan, V.J. (2016) Artificial electron acceptors decouple archaeal methane oxidation from sulfate reduction. Science 351, 703-707. Beal, E.J., House, C.H., Orphan, V.J. (2009) Manganese-and iron-dependent marine methane oxidation. Science 325, 184-187. Cai, C., Leu, A.O., Xie, G.-J., Guo, J., Feng, Y., Zhao, J.-X., Tyson, G.W., Yuan, Z., Hu, S. (2018) A methanotrophic archaeon couples anaerobic oxidation of methane to Fe (III) reduction. The ISME Journal 12, 1929-1939. Scheller, S., Goenrich, M., Boecher, R., Thauer, R.K., Jaun, B. (2010) The key nickel enzyme of methanogenesis catalyses the anaerobic oxidation of methane. Nature 465, 606. Krüger, M., Meyerdierks, A., Glöckner, F.O., Amann, R., Widdel, F., Kube, M., Reinhardt, R., Kahnt, J., Böcher, R., Thauer, R.K. (2003) A conspicuous nickel protein in microbial mats that oxidize methane anaerobically. Nature 426, 878-881. Shima, S., Krueger, M., Weinert, T., Demmer, U., Kahnt, J., Thauer, R.K., Ermler, U. (2012) Structure of a methyl-coenzyme M reductase from Black Sea mats that oxidize methane anaerobically. Nature 481, 98. Lloyd, K.G., Alperin, M.J., Teske, A. (2011) Environmental evidence for net methane production and oxidation in putative ANaerobic MEthanotrophic (ANME) archaea. Environmental Microbiology 13, 2548-2564. Beulig, F., Røy, H., McGlynn, S., Jørgensen, B. 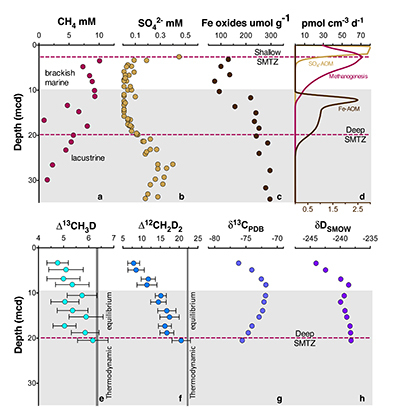 (2019) Cryptic CH4 cycling in the sulfate-methane transition of marine sediments apparently mediated by ANME-1 archaea. The ISME Journal 13, 250-262. Eiler, J.M. (2007) "Clumped-isotope" geochemistry -- The study of naturally-occurring, multiply-substituted isotopologues. Earth and Planetary Science Letters 262, 309-327. Piasecki, A., Sessions, A., Peterson, B., Eiler, J. (2016) Prediction of equilibrium distributions of isotopologues for methane, ethane and propane using density functional theory. Geochimica et Cosmochimica Acta 190, 1-12. Stolper, D.A., Martini, A.M., Clog, M., Douglas, P.M., Shusta, S.S., Valentine, D.L., Sessions, A.L., Eiler, J.M. (2015) Distinguishing and understanding thermogenic and biogenic sources of methane using multiply substituted isotopologues. Geochimica et Cosmochimica Acta 161, 219-247. Wang, D.T., Gruen, D.S., Lollar, B.S., Hinrichs, K.-U., Stewart, L.C., Holden, J.F., Hristov, A.N., Pohlman, J.W., Morrill, P.L., Könneke, M. (2015) Nonequilibrium clumped isotope signals in microbial methane. Science 348, 428-431. Douglas, P., Stolper, D., Smith, D., Anthony, K.W., Paull, C., Dallimore, S., Wik, M., Crill, P.M., Winterdahl, M., Eiler, J. (2016) Diverse origins of Arctic and Subarctic methane point source emissions identified with multiply-substituted isotopologues. Geochimica et Cosmochimica Acta 188, 163-188. Young, E., Kohl, I., Lollar, B.S., Etiope, G., Rumble, D., Li, S., Haghnegahdar, M., Schauble, E., McCain, K., Foustoukos, D. (2017) The relative abundances of resolved 12CH2D2 and 13CH3D and mechanisms controlling isotopic bond ordering in abiotic and biotic methane gases. Geochimica et Cosmochimica Acta 203, 235-264. Gruen, D.S., Wang, D.T., Könneke, M., Topçuoğlu, B.D., Stewart, L.C., Goldhammer, T., Holden, J.F., Hinrichs, K.-U., Ono, S. (2018) Experimental investigation on the controls of clumped isotopologue and hydrogen isotope ratios in microbial methane. Geochimica et Cosmochimica Acta 237, 339-356. Wang, D.T., Welander, P.V., Ono, S. (2016) Fractionation of the methane isotopologues 13 CH 4, 12 CH 3 D, and 13 CH 3 D during aerobic oxidation of methane by Methylococcus capsulatus (Bath). Geochimica et Cosmochimica Acta 192, 186-202. ). The use of a second rare isotopologue, 12CH2D2, aids in interpreting the causes of intra-methane disequilibrium and suggests that microbial methanogenesis does not lead to isotopologue equilibrium among methane molecules. Andrén, T., Jorgensen, B., Cotterill, C., Green, S., Andrén, E., Ash, J., Bauersachs, T., Cragg, B., Fanget, A., Fehr, A. (2015) Expedition 347 Baltic Sea Paleoenvironment. Proceedings of the Integrated Ocean Drilling Program 347, 1-66. Egger, M., Hagens, M., Sapart, C.J., Dijkstra, N., van Helmond, N.A., Mogollón, J.M., Risgaard-Petersen, N., van der Veen, C., Kasten, S., Riedinger, N. (2017) Iron oxide reduction in methane-rich deep Baltic Sea sediments. Geochimica et Cosmochimica Acta 207, 256-276. Dijkstra, N., Hagens, M., Egger, M., Slomp, C.P. (2018) Post-depositional vivianite formation alters sediment phosphorus records. Biogeosciences 15, 861-883.
) to determine parameters controlling the isotopic composition of methane (Fig. 1a-d). Methane δ13C and δD, δ13CDIC, δ13CTOC and δDH2O vary non-monotonically over 30 metres below seafloor (Fig. 1g,h; Fig. S-1) while Δ13CH3D and Δ12CH2D2 values increase with depth (Fig. 1e,f). ). CH4 production (purple) and SO4-AOM (gold) rates correspond with the upper x axis and Fe-AOM rates (brown) correspond with the lower x axis. SO4-AOM rates above the upper SMTZ are calculated using bottom water SO4 concentrations of 15.0 mM. Additional porewater data shown in Supplementary Information. ). For instance, the hydrogen isotopes in methane are seemingly not equilibrated with porewater that changes by >100 ‰ in this interval (Fig. S-1), obscuring the history of this reservoir. Instead, we will focus on the intra-molecular isotopic equilibrium of the methane itself using clumped isotopes, thus sidestepping the complications in bulk isotope ratios. We introduce ξ12CH2D2, a parameter that quantifies the degree of thermodynamic disequilibrium for a methane system. ξ12CH2D2 is analogous to the symbol for the reaction progress variable (ξ12CH2D2 = Δ12CH2D2, measured - Δ12CH2D2, equilibrium, see Supplementary Information). 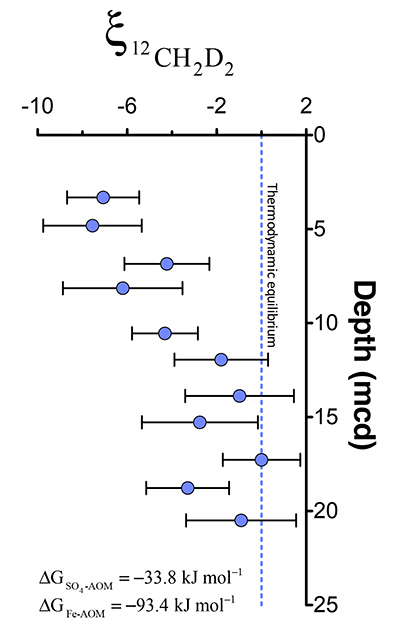 Values for ξ12CH2D2 in upper sediments as low as -7.5 ‰ are significantly different (>6 σ) from 0 ‰ (i.e. thermodynamic equilibrium) which is approached with depth (Fig. 2). In order to determine how methanogenesis and methanotrophy influence this transition, we consider evidence for and against reversibility in each metabolism. Moran, J.J., House, C.H., Freeman, K.H., Ferry, J.G. (2005) Trace methane oxidation studied in several Euryarchaeota under diverse conditions. Archaea 1, 303-309. Moran, J.J., House, C.H., Thomas, B., Freeman, K.H. (2007) Products of trace methane oxidation during nonmethyltrophic growth by Methanosarcina. Journal of Geophysical Research: Biogeosciences 112. Valentine, D.L., Chidthaisong, A., Rice, A., Reeburgh, W.S., Tyler, S.C. (2004) Carbon and hydrogen isotope fractionation by moderately thermophilic methanogens. Geochimica et Cosmochimica Acta 68, 1571-1590. Gärtner, P., Weiss, D.S., Harms, U., Thauer, R.K. (1994) N5‐Methyltetrahydromethanopterin: Coenzyme M Methyltransferase from Methanobacterium thermoautotrophicum. The FEBS Journal 226, 465-472. Thauer, R.K. (2011) Anaerobic oxidation of methane with sulfate: on the reversibility of the reactions that are catalyzed by enzymes also involved in methanogenesis from CO2. Current Opinion in Microbiology 14, 292-299. Soo, V.W., McAnulty, M.J., Tripathi, A., Zhu, F., Zhang, L., Hatzakis, E., Smith, P.B., Agrawal, S., Nazem-Bokaee, H., Gopalakrishnan, S. (2016) Reversing methanogenesis to capture methane for liquid biofuel precursors. Microbial cell factories 15, 11. Yan, Z., Joshi, P., Gorski, C.A., Ferry, J.G. (2018) A biochemical framework for anaerobic oxidation of methane driven by Fe (III)-dependent respiration. Nature Communications 9. Timmers, P.H., Welte, C.U., Koehorst, J.J., Plugge, C.M., Jetten, M.S., Stams, A.J. (2017) Reverse Methanogenesis and respiration in methanotrophic archaea. Archaea 2017.
, we calculate the timescale of this equilibration (see Supplementary Information) to be on the order of 103-104 years, consistent with the estimated age of methane at 20 MCD of <~8000 years (Figs. S-1, S-2). Such timescales would vary in environments with differing rates of AOM.
) span from the abiotic to AOM zone. See Supplementary Information for additional sample description. Niemann, H., Lösekann, T., De Beer, D., Elvert, M., Nadalig, T., Knittel, K., Amann, R., Sauter, E.J., Schlüter, M., Klages, M. (2006) Novel microbial communities of the Haakon Mosby mud volcano and their role as a methane sink. Nature 443, 854-858. ), a range of temperatures that is unique and distinguishable from equilibrated thermogenic methane forming in the 100 °C to 250 °C gas window. Abiotic methane may also form at low temperatures, yet even when it is apparently equilibrated in Δ13CH3D, it may exhibit large depletions in Δ12CH2D2 that distinguish it from methane that has undergone exchange catalysis during AOM. We suggest that when combined (as in the ξ12CH2D2 parameter), Δ12CH2D2 and Δ13CH3D values are sensitive indicators of the degree of thermodynamic equilibrium that may be useful in determining the role of enzymatic back reaction during AOM in the global methane cycle. We thank five anonymous reviewers for helpful critiques as well as Laurence Yeung and Edwin Schauble for conversations and advice on early versions of this manuscript. JLA was funded by an NSF GRFP (DGE – 1144087) while this work was ongoing. We thank the crew and technical staff of the Greatship Manisha. This research used samples and/or data provided by the International Ocean Discovery Program (IODP). Funding for this research was provided to JLA and TT by the Deep Carbon Observatory’s Deep Energy Committee. We compare methane clumped isotope composition to geochemical profiles (Andrén et al., 2015; Egger et al., 2017) and present day rates of methanogenesis and methanotrophy calculated with a multicomponent diagenetic model (Dijkstra et al., 2018) to determine parameters controlling the isotopic composition of methane (Fig. 1a-d). Even in well-characterised environments, determining how methanogens and anaerobic methanotrophs influence organic matter degradation can be challenging (Regnier et al., 2011; Beulig et al., 2018). Anaerobic methanotrophs use enzymes homologous to those used by methanogens (Krüger et al., 2003; Shima et al., 2012), prompting questions regarding the directionality of these metabolisms (Lloyd et al., 2011; Beulig et al., 2019). AOM is thought to be carried out by a consortium of methane oxidising archaea and sulphate reducing bacteria performing the net reaction CH4 + SO32- → HCO3- + HS- + H2O (Boetius et al., 2000). These challenges are due in part to how methane produced by methanogens inherits characteristics from its substrates (both a range of organic and inorganic carbon) (Conrad, 2005), and they are further complicated when methane is itself the substrate during anaerobic methane oxidation (AOM) (Whiticar, 1999). Figure 1 [...] Modelled CH4 production, Fe-AOM and SO4-AOM rates are shown in panel d (Dijkstra et al., 2018). Using estimates of AOM rates from Dijkstra et al. (2018), we calculate the timescale of this equilibration (see Supplementary Information) to be on the order of 103-104 years, consistent with the estimated age of methane at 20 MCD of <~8000 years (Figs. S-1, S-2). For instance, axenic cultures of methanogens produce methane with depletions in clumped isotopes relative to the random distribution that reflect kinetic processes (Stolper et al., 2015; Wang et al., 2015; Douglas et al., 2016; Young et al., 2017; Gruen et al., 2018). Quantifying the subsurface carbon cycle by linking biogeochemistry to deep biosphere metabolisms remains a long-standing challenge compounded by slow rates of reaction (Edwards et al., 2012; Marlow et al., 2017). Comparisons of the bulk isotopic composition of methane to carbon and hydrogen reservoirs at this location are complicated by the change from limnic to marine deposition (Egger et al., 2017). Our understanding of how anaerobic methanotrophs respond to varying environmental conditions (Holler et al., 2009, 2011; Yoshinaga et al., 2014) and how they might contribute to “cryptic cycles” (the rapid production and consumption of reactive intermediates) in the marine subsurface is constantly evolving (Egger et al., 2018). Here, we interrogate subsurface methane metabolisms by precisely determining concentrations of molecules containing two heavy isotopes, referred to as “clumped” isotopologues (Eiler, 2007). Although some of the first steps of methanogenesis may be reversible (Valentine et al., 2004), the final transfer of the methyl group to coenzyme M and the subsequent final hydrogen addition are believed to be irreversible (Gärtner et al., 1994; Thauer, 2011). However, the inability to produce equilibrated methane from axenic cultures has led to speculation that AOM may be responsible for equilibrated environmental methane (Stolper et al., 2015; Wang et al., 2016; Young et al., 2017; Gruen et al., 2018). This back reaction is sensitive to concentrations of the terminal electron acceptor SO42- (Holler et al., 2011; Yoshinaga et al., 2014). AOM metabolisms have been shown to be active from -1 °C to 70 °C (Niemann et al., 2006; Holler et al., 2011), a range of temperatures that is unique and distinguishable from equilibrated thermogenic methane forming in the 100 °C to 250 °C gas window. Intra-cellular exposure of methane to Mcr can lead to isotope exchange catalysis during bond rupture and reformation (Marlow et al., 2017), and methane that diffuses back out of the cell could move an environmental reservoir of methane towards thermodynamic equilibrium. Trace methane oxidation (TMO) does occur during methanogenesis, but altering the concentration of H2 or terminal electron acceptors necessary for oxidising methane does not increase TMO and has never been shown to consume greater than ~3 % of the CH4 produced (Moran et al., 2005; Moran et al., 2007). The relative proportions of 13CH3D and 12CH2D2 (reported as Δ13CH3D and Δ12CH2D2 values relative to a random distribution of isotopes among all CH4 isotopologues; see Supplementary Information) have known temperature sensitive equilibrium concentrations and thus are sensitive indicators of reversibility in reactions (Piasecki et al., 2016). In all cases, the first step of AOM involves C-H bond activation by a modified methyl-coenzyme M reductase (Mcr), the terminal enzyme in methanogenesis (Scheller et al., 2010). Work on determining the biochemical pathways of Fe(III) reducing ANME has so far required genetically modifying a methanogen, M. acetivorans with the Mcr from an ANME-1 group organism because unmodified M. acetivorans are unable to be cultured on methane without the modified Mcr (Soo et al., 2016; Yan et al., 2018). Previous work using one rare isotopologue (Δ13CH3D) suggests that the rate of methanogenesis controls the degree of molecular isotopic equilibrium (Stolper et al., 2015; Wang et al., 2015). 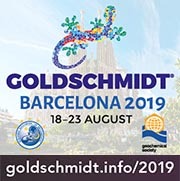 At high concentrations of SO42-, the back reaction produces 3-7 % of the CH4 consumed by AOM, and at low concentrations of SO42- (below 0.5 mM), back reaction can produce as much as 78 % of the CH4 consumed by AOM (Yoshinaga et al., 2014; Timmers et al., 2017). In some cases, the clumped isotope composition of environmental microbial methane is consistent with the axenic cultures, but in others it displays a clumped isotope composition reflective of equilibration within the environment of formation (Wang et al., 2015; Young et al., 2017). This suggests that as energy-rich fractures open, Mcr exposure during the initial step of AOM catalytically exchanges isotopes leaving behind a reservoir that moves closer to thermodynamic equilibrium (Young et al., 2017). Figure 3 [...] Bornholm Basin data (magenta diamonds) span between the methanogenesis and AOM zones, while data from Kidd Creek Mine (black to white symbols) (Young et al., 2017) span from the abiotic to AOM zone.